The Best Faux Flowers - Promise! 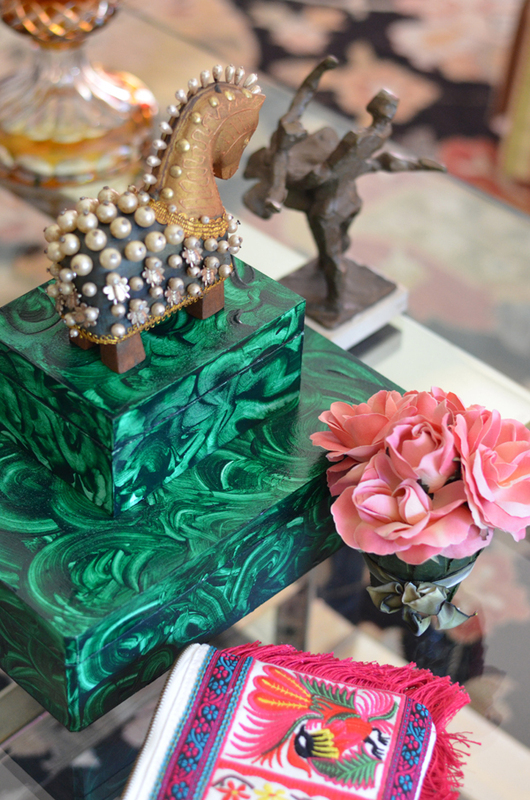 This story begins with this photo taken by me to show you my DIY malachite boxes. Recently, Jenny from LGN, borrowed the photo for a malachite DIY roundup she was doing. That same day I receive a comment from a very sweet lady, Carolyn, telling me that these flowers are from her family's faux floral company called Diane James Home, a company which her mother started and is now run by herself and her twin sister. 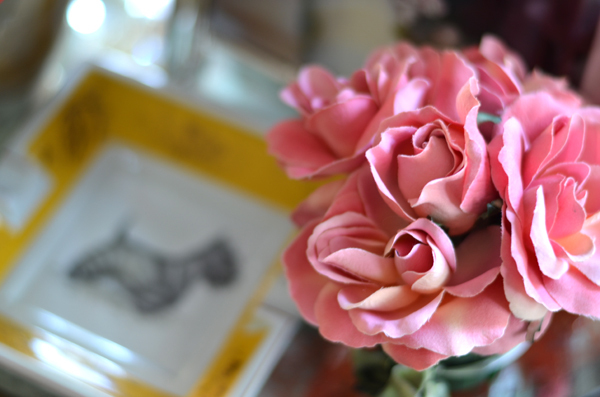 She told me exactly where and when these flowers were bought- twelve years ago at Bergdorf's. Yes! Exactly I said! They had been a gift from my mom for Valentine's day way back. I was so excited about this email because a) these flowers have a special place in my heart b) my mom is also a fan and has several of these arrangements c) I just love coincidences. So, I emailed Carolyn, right away to tell her I could not believe she recognized the arrangement and to share with her my excitement. These bouquets from Diane James Home are beautiful and very realistic. My mom and I just adore our little treasures. I'm in good company loving these arangements as Michael Smith, Barbara Barry, and Mario Buatta use them in their interior designs as well. They kind of feel like the flowers were just cut, gathered, and arranged. They really have a very natural and organic look and feel. 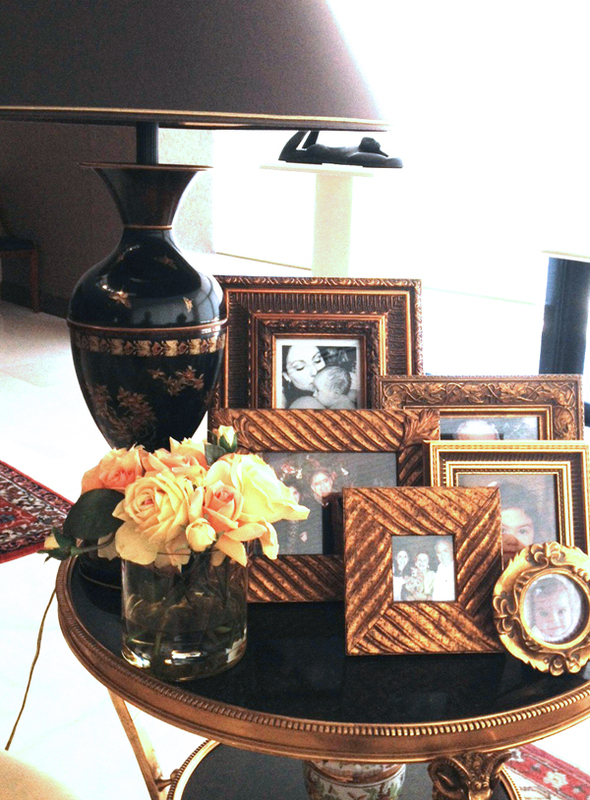 Here are more of my little roses and then I share my parents' arrangements. The last two photos are courtesy of my mom and dad. They worked on taking the photos and sending them together. So cute! Thank you! I love those wild magnolias! Are you a fan of faux florals? Which one is tickling your fancy? I think number three is fab for all those peony lovers! Can you imagine a peony in your bookcase year round? Oh MY Gosh those peonies look so real! What a lovely and interesting story, such a small world! 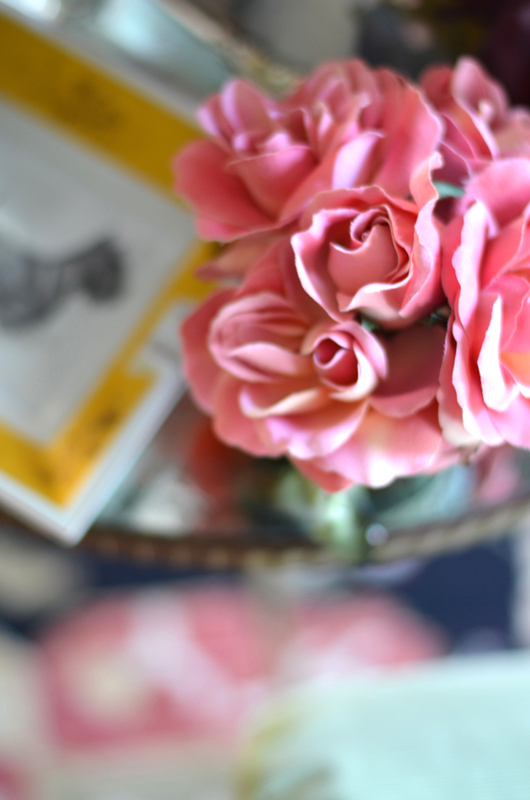 I have not really been a fan of faux flowers in the past, but these are so pretty they have me convinced! Plus, replacing real flowers constantly isn't exactly in my teeny student budget! At first glance I thought they were real! I typically in the past have been turned off by the faux variety but this has me changed! Those peonies look real! I'm a HUGE fan of faux if they look real which these look ... amazing. thanks for sharing your source! I like the peonies of course. Whoa! I'm usually not a fan of faux flowers but these look like the real deal especially the last photo. Great coincidence! I LOVE THE story! 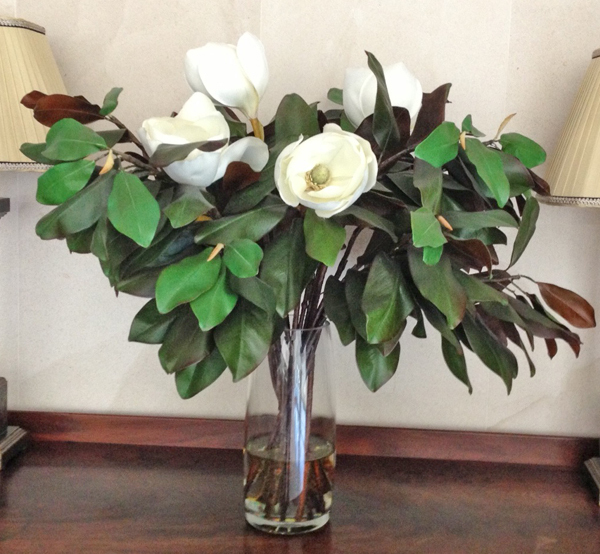 I am NOT a fan of faux florals, but I tell you what, I could get on board with that magnolia arrangement. I love it! omg really? i need these!!! This is so funny. I was just about to Google for really good faux orchids. Mine have died, and I'm over trying to keep real ones. I'm going to see if this company makes orchids. Love the boxes, and it is on my "must try" list. What a crazy coincidence! I love when serendipitous things that like that happen, ESPECIALLY in the blog world. Makes this community that much more special. Oh my goodness Albertina, I didn't know faux flowers could look so real! I want #6 & #8 now...I will definitely keep these in mind as I will be decorating a new place in the fall. Thanks for sharing and love the story behind them (I think items around the house hold so much more value/beauty when memories & stories are attached)! PS thanks for visiting Life on the Squares this morning. These look amazingly real! Love no. 3! I'm a faux fan since I don't have much luck with real flowers. You are the sweetest, Albertina, and we are blushing with pride! Thank you for the kind words and for allowing our pretty posies to grace the pages of Mimosa Lane. We love meeting fellow faux fans through blogging and feel as if our community has grown that much larger with this post. Wishing you a great week! These all look SO real. I usually hate faux flowers, but I want some of these for my desk at work! i think u might have me sold - i'm going to check out how much they are! - thanks for the heads up! Ok these look amazing! Wow how funny is that she recognized them, love the story! I've always been wary of fake flowers, but these all look super realistic. Thanks for sharing! i love love the sweet story behind it! may have to invest on them! I'm such a fan of faux florals! What a cool story about your bouquet! Albertina. You are kidding. These are amazing. And such a lovely story to go along with them! I would never have guessed they were not real! Do they still sale them?? It's an amazing story! Incredible and touching! Those faux flowers are really cute and I have faux flowers at home too. I love them because they can last forever ...! wow these look great! I've been considering some faux flowers so I can have some pretty but don't need to change them out constantly. so funny that she recognized the flowers! I am the biggest fan of their gorgeous flowers and with my black thumb, I should definitely have them. The hydrangea are amazing!! Never thought Faux Flowers could look so amazing! What a great story! These really do look so real! I love the peonies and since I can never keep real plants alive maybe I need these in my life! Those boxes! I love DIY projects, but I'm not sure I could do this as well as you!